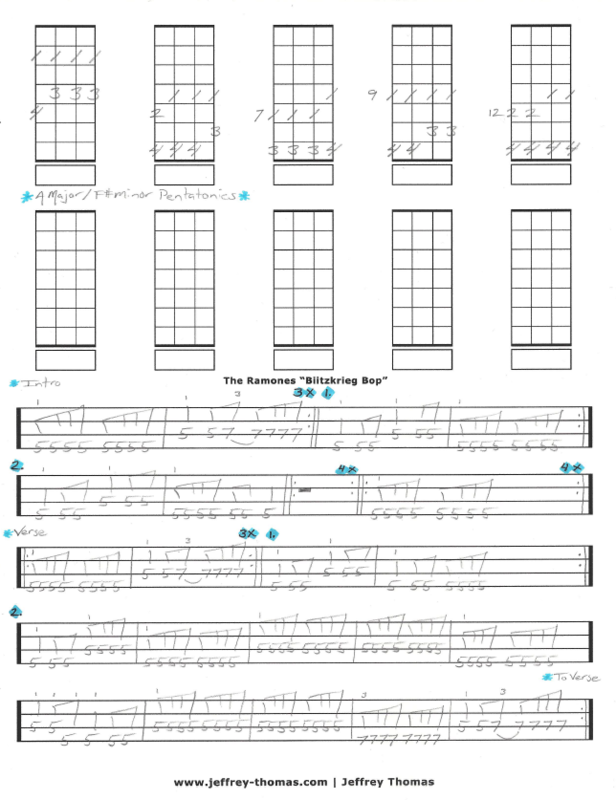 The Ramones Blitzkrieg Bop Free Bass Tab by Jeffrey Thomas. This free bass tab will has the complete song structure and all the right licks. I also included all 5 pentatonic patterns for A Major and F# minor so you can play the right scales for a solo or fills. Blitzkrieg Bop is probably one of the most popular tunes by The Ramones and my bass students love it. Want the full bass tab for free? Just send in your email address on the form provided. Looking for online bass lessons? Fill out the Schedule A Free Lesson form to set up your free Skype bass lesson today. “Blitzkrieg Bop” is number 92 on the Rolling Stone list of The 500 Greatest Songs Of All Time! Find more great tunes, lessons and tabs on my online bass tab archive.